There are also open-source software packages providing all the necessary tools to acquire data from different hardware equipment. These tools come from the scientific community where complex experiment requires fast, flexible and adaptable software. Those packages are usually custom fit but more general DAQ package like the Maximum Integrated Data Acquisition System can be easily tailored and is used in several physics experiments worldwide. In 1963, IBM produced computers which specialized in data acquisition. These include the IBM 7700 Data Acquisition System, and its successor, the IBM 1800 Data Acquisition and Control System. These expensive specialized systems were surpassed in 1974 by general purpose S-100 computers and data acquisitions cards produced by Tecmar/Scientific Solutions Inc. In 1981 IBM introduced the IBM Personal Computer and Scientific Solutions introduced the first PC data acquisition products. A sensor, which is a type of transducer, is a device that converts a physical property into a corresponding electrical signal (e.g., strain gauge, thermistor). An acquisition system to measure different properties depends on the sensors that are suited to detect those properties. Signal conditioning may be necessary if the signal from the transducer is not suitable for the DAQ hardware being used. The signal may need to be filtered or amplified in most cases. Various other examples of signal conditioning might be bridge completion, providing current or voltage excitation to the sensor, isolation, linearization. 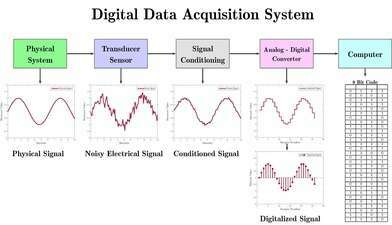 For transmission purposes, single ended analog signals, which are more susceptible to noise can be converted to differential signals. Once digitized, the signal can be encoded to reduce and correct transmission errors. DAQ device drivers are needed in order for the DAQ hardware to work with a PC. The device driver performs low-level register writes and reads on the hardware, while exposing API for developing user applications in a variety of programming environments. ↑ COMDEX Fall November 18, 1981 Las Vegas, NV, "Tecmar shows 20 IBM PC option card.. LabMaster, LabTender, DADIO, DeviceTender, IEEE-488.."
↑ Data logger, Recorder, Data Acquisition – Background information Byte Paradigm – explains the differences between data logging and data acquisition. Wikimedia Commons has media related to Data acquisition.